Everyone remembers the original Dumbo movie about the adorable big-eared baby elephant born into a circus who is sadly separated from his mother but reunited in the end. The movie starts out sad with Dumbo being ridiculed and his mother being taken away from him after losing her temper towards his taunters. A mouse friend comes to Dumbo’s rescue by taking him in and persuading the circus director to give Dumbo a roll in the show. After Dumbo wows the audience by using his ears to fly, the movie ends celebrating him as the star of the show and being reunited with his mother. Dumbo is the most recent review to be added to my Movie Review list! 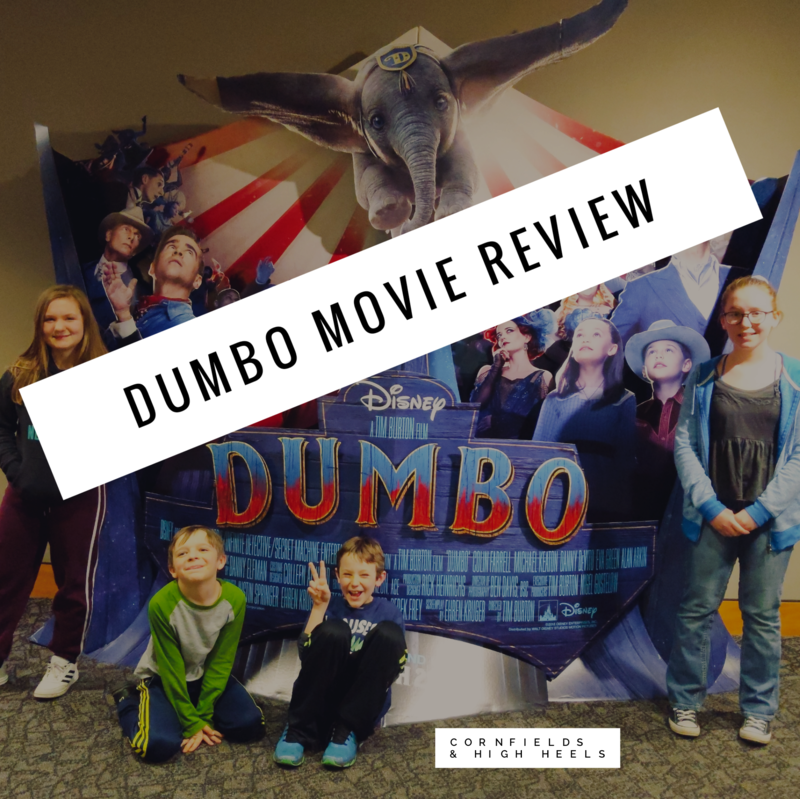 I had the opportunity to take my family to the pre-screening of Dumbo with theCityMoms of Greater Indianapolis. The new Dumbo film, a live-action, re-imagining of the original created by Disney, shares the same storyline with a variety of different scenes from the original. Instead of Timothy the mouse, two young children (Milly & Joe) train and care for Dumbo after a loss has struck both their family and the Medici circus, which they were born into. With the help of their father (Holt), who has returned to the circus injured from the war, Dumbo is trained to fly in one of the best circuses in the county after their circus director (played by Danny Devito) joins in a partnership with V.A. Vandevere (a villain played by Michael Keaton). Dumbo flys for audiences with the hope and promise that he will be reunited with his mother. When this doesn’t happen, the Medici Circus crew devises a plan to rescue Dumbo and his mother from Vandevere. In the end, Dumbo and his mother are reunited and the Medici Circus is thriving as a newly improved circus who no longer cages animals and brings awareness to animal cruelty. This film brings back all the feel-goods and nostalgia of my childhood. With a bit of modern-day twist and weird Tim Burton touches, I’ve concluded that I prefer the newer version for several reasons. From the great array of actors to being family friendly and great for teens and adults, it left me feeling good about leaving a positive review. With actors Danny Devito, Colin Ferrell, Michael Keaton, and Eva Green it held the most unique yet also perfect cast for the roles played. The one con to this movie I do have was that I didn’t feel the previews before the movie were suitable to the family film we were about it see, it seemed a bit gruesome and scary for a younger audience. Again, this was a pre-screening though so the previews may be different once the film opens on Friday, March 29th, 2019. Special thanks to theCityMoms of Greater Indianapolis, IMAX at the Indiana State Museum, and Disney for this advanced pre-screening! Check out my other Disney movie review for Captain Marvel here! For a list of all my movie reviews, click here!